The afternoon sunlight filters through the trees, and we hear the sound of water softly trickling under the footbridge as we make our way across. Just up the road, in the town center of Jacksonville, Vermont, we have passed a community pie sale that is drawing some attention. This is apple orchard country, producing a yield that is good for pies and much more. The Vermont climate is too dramatic to cultivate grape vines, so the local wines are made from the fruit of the land. Everywhere we have walked, we have encountered gnarled and twisted apple trees, branches bending and studded with globes of red fruit. 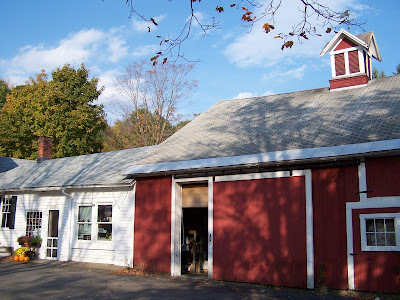 We cross the North River, and enter the tasting room of the North River Winery, a tidy white structure attached to a red barn that dates to the 1850s and houses the winery. I am somewhat ambivalent about fruit wines. In a side-by-side taste test, I’m likely to pick the Bordeaux every time. 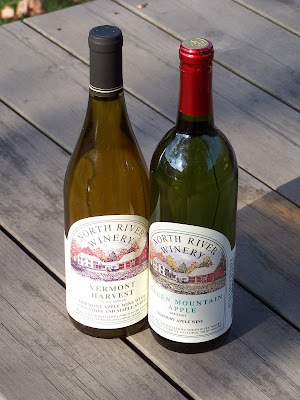 But, the homegrown quality and resourcefulness behind North River wines has intrigued me. Comparisons may be misguided. Apple wine is, in fact, a different product that harkens back to a day when thrifty homesteaders would ferment almost anything -- barley, rye, corn or potatoes. Even Martha Washington’s personal recipe collection includes directions for fermenting wines made with cherries, currants, lemons, gooseberries, blackberries and elderberries. We step up to the tasting bar, and are greeted by an earnest young man who hands us each a list of wines. 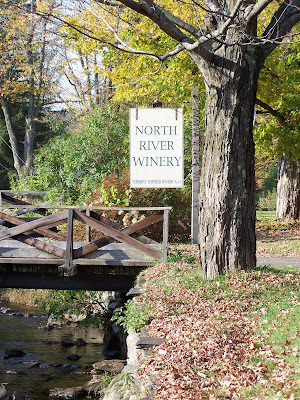 The North River Winery was started in 1985, and most of the apples used in the wine come from the nearby Dwight Miller Orchards, a certified Vermont state organic orchard. We start with a taste of Vermont Pear which is labeled “semi-dry” but is sweet and thick like nectar. Green Mountain Apple is more to my liking – its crisp, tart flavors reminiscent of a Sauvignon Blanc. The signature Rhubarb wine is perhaps an acquired taste, and while it might actually defy description, tart and earthy are two words that immediately jump to mind. Cranberry Apple tastes tart like a Thanksgiving relish and Blueberry Apple would make a nice topping for vanilla ice cream. Finally, we sip Vermont Harvest, a blend of apples, cinnamon and Vermont maple syrup. Our host calls it “apple pie in a bottle” and it does conjure up flavors of the sweet finale to a fine autumn dinner. The old saying, “an apple a day, keeps the doctor away,” actually has its roots in medieval times. Green Mountain Apple and Vermont Harvest could be an interesting way to get more of the health benefits of apples into my diet, so I purchase a bottle of each. It’s not as crunchy as the real thing, but I can use my imagination. What an interesting assortment of wines. The Rhubarb wine sounds wild... guess you can make wine out of almost anything. My husband, the wine drinker in our family, always turns down his nose at the notion of fruit wines. And, indeed, most are wretched, so I can understand his feeling. However, maybe the "get more fruit into your diet" approach will work for him! Once again, too, your photos are beautiful and make me feel that I am wandering through apple country. I love the picture of that lone apple in the tree. I have never had fruit wines but the thought of apple pie in a bottle makes me want to try it out! Hi Diane - I think the apple wines are quite good as dessert wines, but there's a point where I might draw the line! Thanks Lydia - I think a beautiful day and a digital camera go a long way! 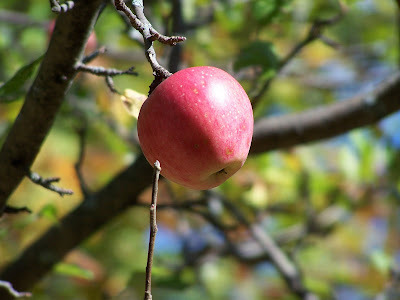 Veron - I seem to be addicted to taking pictures of apples and fruit hanging from branches! Great first shot, T.W. I wish I could stroll through an apple orchard this weekend.